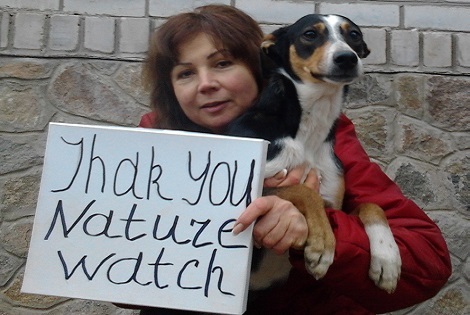 2016 is shaping up to be a busy year in Ukraine for Naturewatch Foundation. As the result of our Christmas Campaign, when we appealed to you for help to support our ongoing work, we are delighted to report that we have committed to carry out the following projects this year. Melitopol - In January, our two representatives in Ukraine visited the city of Melitopol and took part in a conference held to discuss the city’s proposed stray animal control programme. Our representatives were successful in getting the message across that removing dogs from the streets is just the tip of the iceberg – simply a quick fix and that the city must adopt a comprehensive, humane and sustainable programme that also addresses the source of the problem if they want to permanently reduce the number of stray animals in Melitopol - the source of the problem being irresponsible pet ownership and lack of information/education. We also briefly covered the main things that need to be done such as: providing conditions for control of breeding (subsidised spay/neuter surgeries, legislation that regulates breeding); providing education about responsible pet ownership (no free roaming, information about sterilising pets, proper care of pets and how to behave around stray animals); providing conditions for pet owners (walking areas, pet registration and identification); removing conditions that stimulate stray dogs to breed (rubbish dumps). As a direct result, we are delighted to confirm that the city is keen to implement our education programme for young people to teach them to respect animals as sentient beings and how to be a responsible pet owner. It’s rewarding to learn that the authorities now understand that only by addressing the root of the problem will they safeguard the sustainability of their programme to reduce stray animal populations in Melitopol for the long-term. To this end, we are in the process of organizing a two-day workshop for teachers of children of all ages. Lviv - The city is in the process of reforming its animal welfare system based upon the programme provided by Naturewatch Foundation last year. As part of this programme, we are in the process of organizing another education workshop with the Post Graduate Teacher Training Institute and the local Department of Education in Lviv in order to expand our educational work in this city. As you will have read in our Christmas campaign letter, the first workshop went very well resulting in our programme for primary school children being incorporated into the city’s Primary School Education Curriculum. The team of teachers we’re been working with in Lviv are very experienced and, via cascade training, they are keen to pass their knowledge down to even more teachers taking the programme to the next level by also providing lessons for secondary school children. Following on from our support in 2015 when you helped provide essential veterinary equipment, medicines, and an animal rescue vehicle, which saved the lives 1014 dogs and cats in the first 9 months, we are delighted to confirm that we will be providing a range of diagnostic equipment to enable the Laska vets to make an early diagnosis, thereby saving the lives of even more animals. In addition, we will be sending six months supply of veterinary medicines and providing new cages for the animal ambulance purchased a year ago as the ones they are using are old, homemade of wood and cannot be cleaned properly. More information about this project will be added to our website in due course.